I like to have friends come to our home for dinner. I enjoy good conversation, a glass of wine and a great meal. 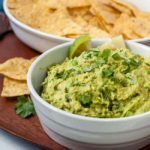 But often, I spend most of the day in the kitchen, prepping eye-catching dishes that require last minute cooking or plating that takes me away from my guests. 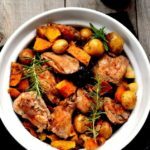 We invited friends for Friday night dinner, and I decided to serve this Harvest Chicken with Bacon and Rosemary dish that could be made completely ahead of time and simply warmed in the oven after our appy snacks had been depleted. I knew I’d be preparing Thanksgiving dinner all day Sunday so I wanted something easy so I wasn’t spending the entire weekend cooking. I was able to sit down, enjoy that glass of wine and actually participate in the conversation. Smart. I felt quite smug. But wait, there’s more to this brilliance. I doubled the recipe and made enough for another complete meal, planning to freeze it. Unknown to us (and I think to them until the last minute) our friends from Alberta arrived in town for the weekend. When they called on Saturday to see if we could get together for coffee that day, guess what I could say without hesitation! C’mon over for dinner–it’s made! As I said, I finally got smart. Mmmm . . . What could be better on a cool fall night than warm harvest-time veggies all bathed in bacon and onions and red wine and scented with fresh rosemary! 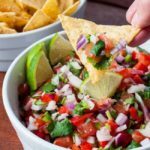 Using boneless chicken thighs or breasts in this recipe reduces the cooking time and makes it easy for guests to eat without worrying about what to do with that bone. Take advantage of fall vegetables that are available now, like squash, small potatoes, sweet potatoes and mushrooms. Don’t leave out the apples! They add a perfect sweet contrast to the saltiness of the bacon. 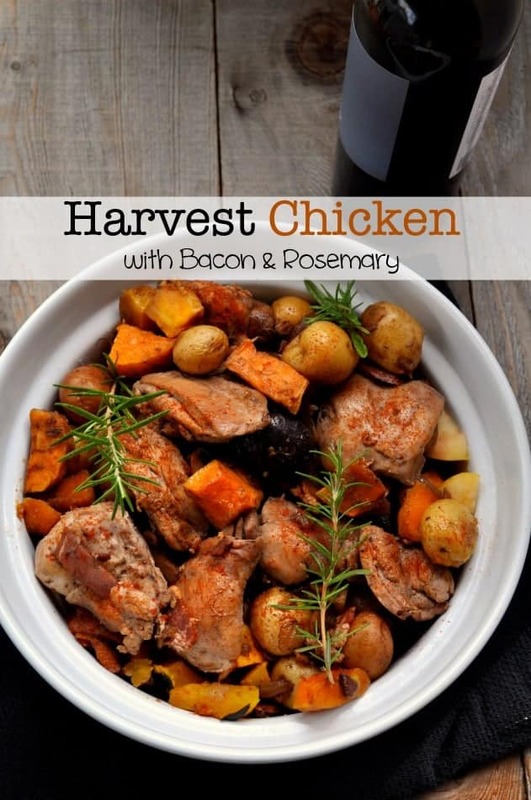 Hope you like this Harvest Chicken with Bacon and Rosemary as much as we did. 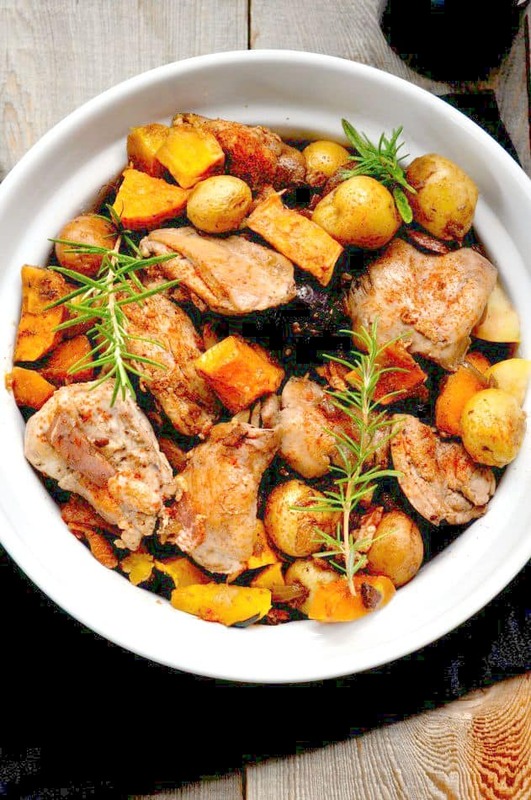 Chicken simmered with harvest-time veggies bathed in bacon, onions and red wine and scented with fresh rosemary. This dish can be made in advance and warmed in the oven just before serving. Naturally dairy-free and gluten-free, it's a perfect dinner for a fall evening. Pre-heat oven to 350°F. Toss chopped potatoes, sweet potatoes, and squash with 1 Tablespoon oil and spread out on parchment paper-lined baking sheets. Roast for 15 minutes, turning once until vegetables have slightly crisped edges. They will continue to cook in the pan later. 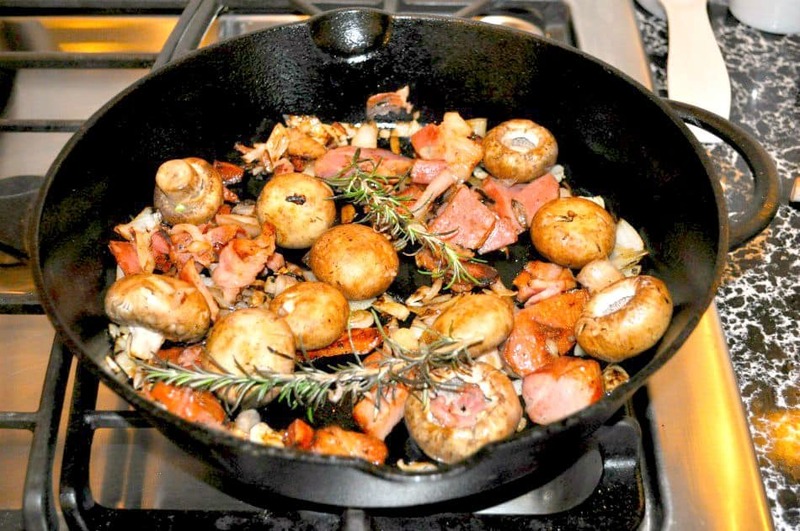 Meanwhile, In a large, heavy-bottomed oven-proof pot or deep pan (I used a large cast-iron fry pan) over medium heat, add the bacon, onions, mushrooms, and garlic. Cook until the onions are translucent. Remove this mixture from the pan and set aside. Increase the heat and add two tablespoons of butter to the pan. Brown the chicken on both sides. Pour off the excess fat and deglaze the pan with the red wine. Reduce the heat and return the bacon mixture to the pan.. Mix in the roasted potatoes, sweet potatoes, squash, and now add the apples. Tuck in the rosemary sprigs. Cook on medium low for 15 minutes or until chicken is cooked through and vegetables are tender. If you're using chicken with the skin on, remove the lid and place under the broiler to crisp the skin slightly. Garnish with additional chopped rosemary and serve. I adapted this recipe from Three Beans on a String’s Housewife Chicken, Apples and Fall Vegetables which, in turn, was a variation of Julia Child’s “Poulet en Cocotte Bonne Femme”. Elizabeth, of Three Beans on a String, uses bone-in chicken thighs and conveniently cooks it all in one pot. I opted to use boneless chicken to speed up the cooking time. I also like to have crispy edges on roasted vegetables so I chose to roast the fall veggies in the oven first before adding them to the dish. So glad this recipe worked for you, Elaine. 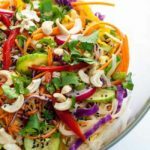 I’ve enjoyed seeing all the variations from other experienced cooks who are making this – it’s so much fun. The boneless chicken is a great idea. And thanks for taking the original Julia Child recipe and making it work for the rest of us! We love this dish and I’ll make it frequently. 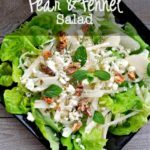 I love the looks of this recipe. Nothing goes better with chicken than rosemary. I will definitely add it to my to do list. It’s worth it! It has become a favourite in our home. Let me know if you make it and what you thought of it.